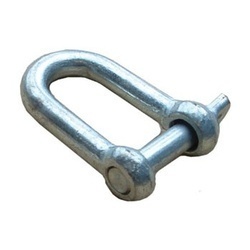 Keeping in mind ever-changing and rising needs and requirements of our honorable customers, we are bringing forth an outstanding collection of D Shackle. Fabricated and developed with supreme meticulousness and correctness, these are extensively used in numerous industries. Apart from this, their wide usage in diverse places makes these enormously famed. Along with this, we ensure that these are sturdy and work for a longer span of time without any hassle. Incepted in the year 2009, Dharmesh Trading Company is a leading organization affianced in Manufacturing, Trading, Wholesaling and Retailing a huge gamut of Webbing Sling, Lashing System, Bracket System, Lashing Hook, Lifting Jacks For Truck and Trailer, Trailer Suspension Part, Trailer Part, Clamp Plate For Trailer, Trailer Bolt, Fifth Wheel Pin and Lock and Material Handling and Lifting Equipment. Fabricated and developed as per the industry prescribed production at manufacturing unit, these provided products are highly tough in nature and are acknowledged for their robust nature.The complete collection is exactly manufactured under the administration of our professionals making use of contemporary tools and techniques together with the utilization of supreme grade material and other factory material. Along with this, these are inspected by us on numerous grounds before finally delivering at the premises of our customers.